Let your boat of life be light, packed with only what you need--a homely home and simple pleasures, one or two friends, worth the name, some one to love and some one to love you, a cat, a dog, and a pipe or two, enough to eat and enough to wear, and a little more than enough to drink; for thirst is a dangerous thing. I can do without the pipe or two but, other than that, I think Jerome K. Jerome got it right. In the midst of all the nonsense in Three Men in a Boat, there is a bit of wisdom. At the end of a grumpy day (or so my kids say) here is a list of simple pleasures that should cheer up even the grumpiest mother. Chocolate chip cookies warm from the oven. The first sip of a perfectly made cup of tea. Or coffee if that is your thing. Standing outside on a country road and listening to the birds sing. A hug from the person/people you love best in the world. The handful of buttercups picked and jammed into a cup right before the lawnmower chops them all down. The perfect consignment shop find that rings up at 25% off, making it an even more perfect find. A brand new notebook and pen. Getting into bed right after you have changed the sheets--cool and crisp and tight all around you. An unexpected text from a friend you haven't talked to in a while. The smell and the sound of the ocean. Freshly picked berries--blueberries, strawberries, raspberries. Having plans you are looking forward to. The joy of having plans canceled when you just want to stay home. A good conversation where your minds just click. Finding the right words when you are trying to say something or write something. Sitting by a campfire. Bonus points if someone is playing the guitar and you are making s'mores. What simple pleasures make your life a little bit better? I see you have one of Gladys Taber's books in your pile. She's one of my simple pleasures. My late mother introduced me to her writing. It's calming and descriptive. I've been collecting her books for years. I like all of your simple pleasures, too. My grandmother gave me the Taber book. She read it and thought it sounded like something I would enjoy. Calming and descriptive sounds perfect. I spy The Half Crown House, which I enjoyed a couple of years ago. Simple pleasures indeed, and Three Men in a Boat is a joy. 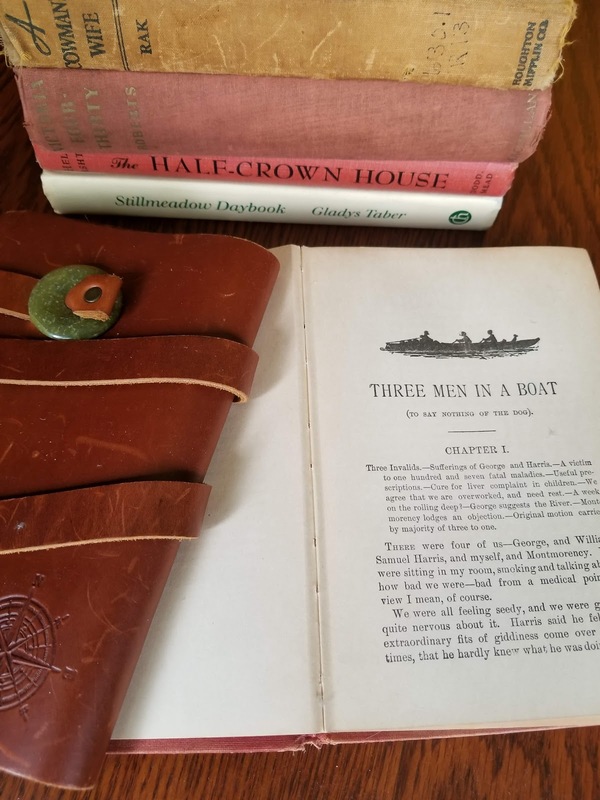 I hadn't read Three Men in a Boat and years. It was just as much fun as I remembered. I might have bought The Half Crown House because of your blog. You are responsible for a lot of my book purchases! I think I agree with everything on your list! I will also eating off a pretty plate, and the feeling of freshly changed sheets (conveniently ignoring the laundry that must ensue, of course). Oh yes! I feel the same way about drinking tea out of a pretty mug. I save some to use when I need to brighten my day. And ignoring the laundry is my life plan. It does backfire on me but I try not to think about that. How could I have left chocolate off that list!? And you are right, a baby's smile is the best thing on earth.